Rob thought it was a (not so) silent cry for help when I said I hadn’t been to the gym for over 2 months. I was hoping I would have good news to share. We ended up going to a spinning class together last weekend but sadly, it was another week without mid-week gym action. I am going to try to go to the gym before work next week, so we’ll see how that goes. While I feel 90-95% back to my regular self, I know I am getting better when I want to return to the gym and more importantly, eat all the desserts. 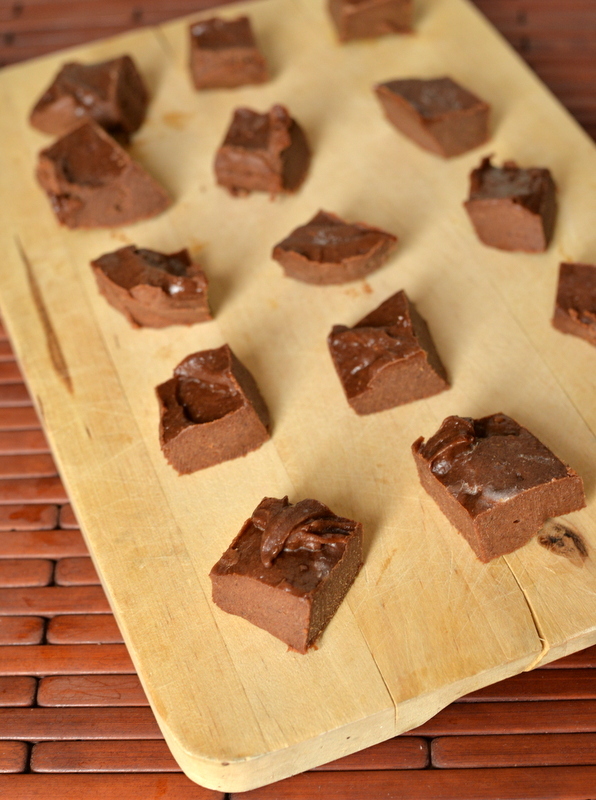 No stranger to freezer fudge (I loved this cinnamon almond freezer fudge), this was a quick snack to stash away until my next chocolate craving. Simple ingredients including dates, almond butter, coconut oil and cacao powder, this was basically like eating a raw vegan chocolate cheesecake from the freezer. However, it was already the perfect consistency the minute you removed it from the freezer. 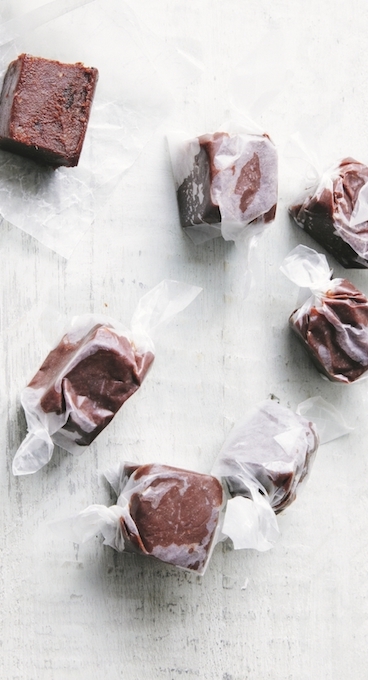 No thawing required. I mistakenly forgot to line my container with parchment paper, so it was a bit more difficult to remove my fudge from the container while still maintaining a semblance of prettiness. Afterwards, I returned the pieces back to the freezer and I had easily accessible nibbles. The recipe stems from Ella Woodward’s first cookbook, Deliciously Ella. You are probably already familiar with her wildly popular blog of the same name, Deliciously Ella. Not to be confused with Naturally Ella who’s name is actually Erin and who also writes cookbooks (confusing, I know). In any case, Ella has shared over 100 plant-based recipes (nearly all gluten-free and all with whole foods ingredients) brimming with photos from nearly every recipe. With her simple approach to coaxing natural flavours out of the foods, this is a very approachable cookbook and her writing style is equally non-threatening. The cookbook is divided into the major pillars of plant-based ingredients: grains, nuts and seeds, beans and legumes, vegetables, fruit, smoothies and juices. While it is a good way to think about approaching a balanced meal as a vegan, I wish the index were more thorough. Imagine not having the Key Lime Pie listed under Lime in the index. Yet it was included under avocados, probably because it was filed in the Fruit chapter. 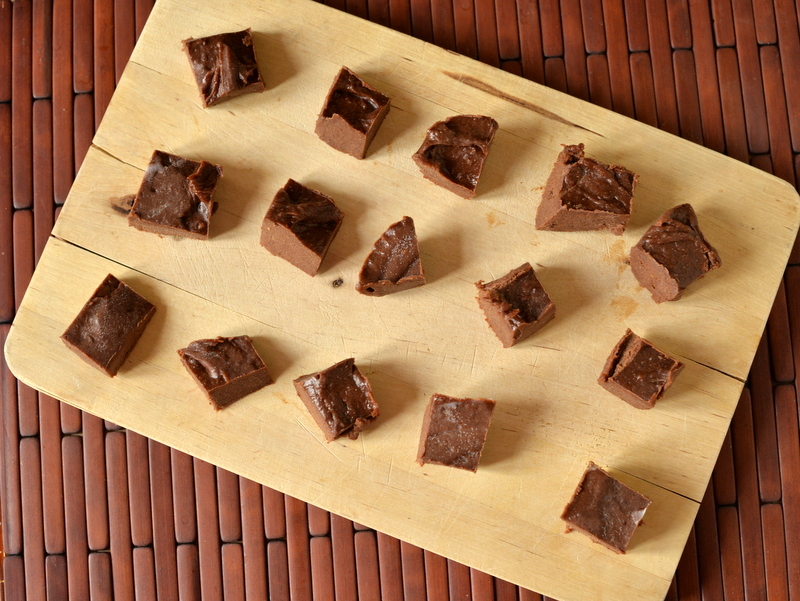 I look forward to eating my way through this cookbook and this freezer fudge was an excellent place to start. Thankfully, the publisher allowed me to giveaway the cookbook to a reader living in Canada. To be entered in the random draw for the book, please leave a comment below telling me what you like most: grains, nuts and seeds, beans and legumes, vegetables, fruit, smoothies or juices. The winner will be selected at random on June 10, 2015. Good luck! Guys, I am super excited to share this cookbook review with you. It is Richa Hingle’s first cookbook: Vegan Richa’s Indian Kitchen. I am sure she needs no introduction, her blog focuses on drool-worthy vegan eats but her heart is in making vegan versions of Indian dishes. 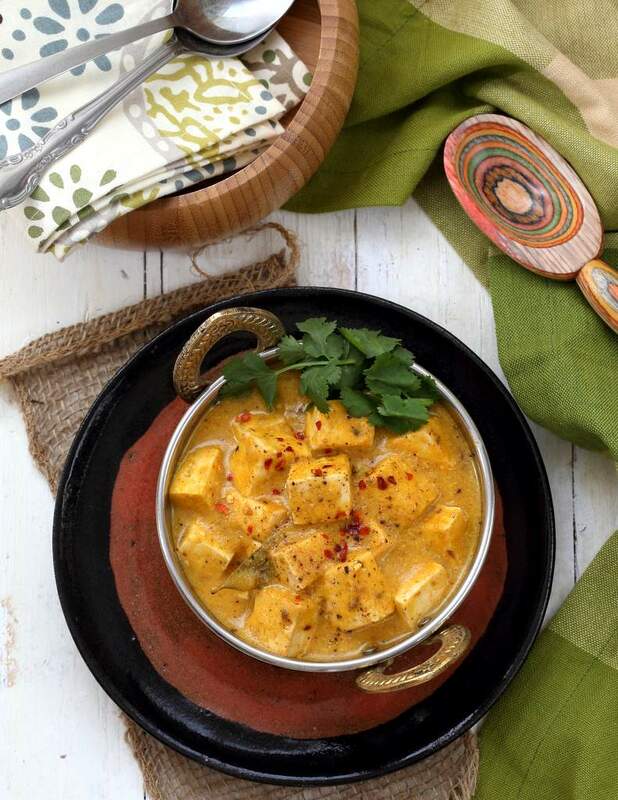 Her photography is nothing short of stunning (see above and below, both of the mango tofu curry) and her recipes are excellent. Many of her testers have been gushing over her book for some time, so I was thrilled to receive an advanced copy for my review. Richa’s book is an excellent foray into Indian cuisine. In all honesty, I usually skip over the beginner introductions in cookbooks but I always found them incredibly important when learning how to cook Indian food. As an example, the names of beans can be so confusing with different names in different locations. With Richa’s slant to the North American kitchen, you can figure out that urad dal is also known as split and skinned black lentils, which is different than mung dal which is split and skinned petite yellow lentils. There are recipes with more easier to find to find ingredients but she relies heavily of traditional procedures and ingredients for authentic taste (tempering, fermenting, spice blends, etc). 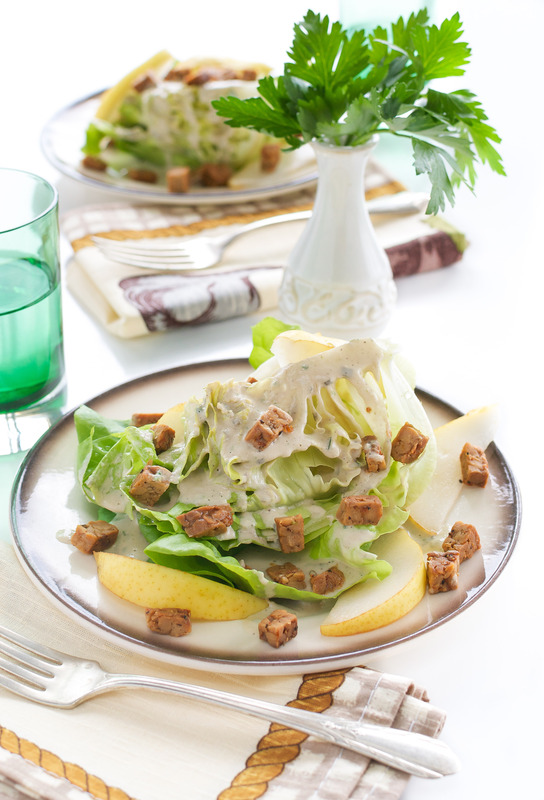 However, she also uses ingredients like tofu and tempeh to substitute the sometimes meat-laden classics. The recipes never seem to end. Richa has structured her cookbook to cover breakfast (Chickpea Flour Pancakes and Savory Oats Hash), Small Plates and Snacks (Savory Lentil Pastries [Baked Dal Kachori] and Spiced Roasted Tofu and Vegetables [Tandoori Tikka]), Sides and Dry Vegetable Curries (Cauliflower Potatoes [Gobi Aloo], Cauliflower and Peas in Spicy Curry [Gobi Mutter Masala]), Lentils and Beans (Butternut Coconut Red Lentil Curry, Restaurant-Style Masoor Dal Tadka), One-Pot Meals and Casseroles (Mung Dal Kitchari, Quinoa Cauliflower Biryani), Main Dishes (Restaurant-Style Navratan Korma, Whole Roasted Cauliflower with Makhani Gravy, Malai Kofta, Chicken-Free Balti), Flatbreads (Avocado Naan, Spicy Chickpea Flour Flatbread), Desserts (Pistachio Almond Ice Cream, Gluten-Free Gulab Jamun) and a chapter for chutneys, spice blends and other basics. This is definitely different than the others. 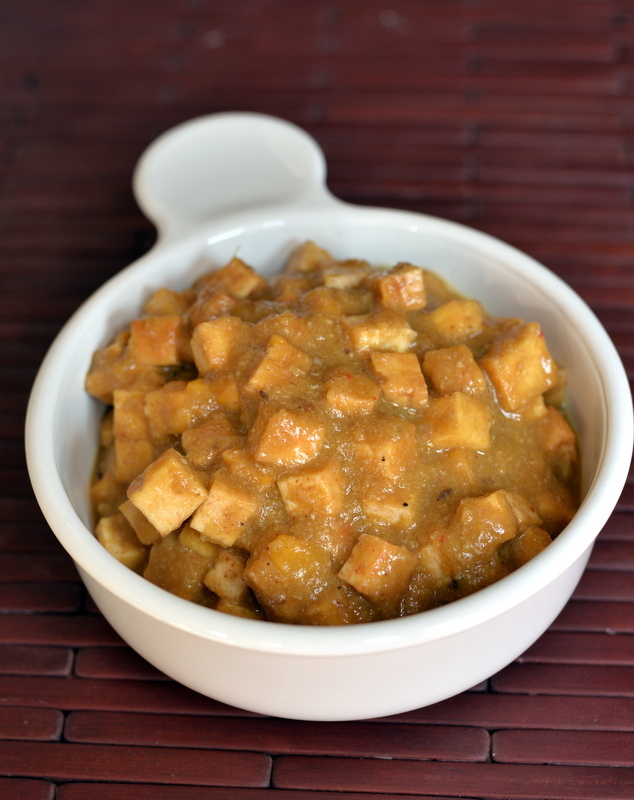 I used frozen mango which I pureed which leant subtle sweetness to the savoury backdrop. 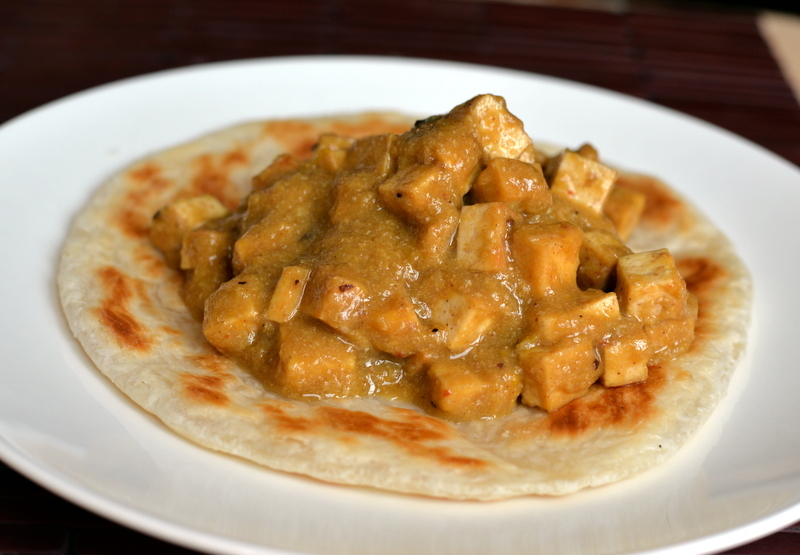 It was a very saucy curry amongst the tofu and we enjoyed it with some parathas. Rice or another type of bread could also work. 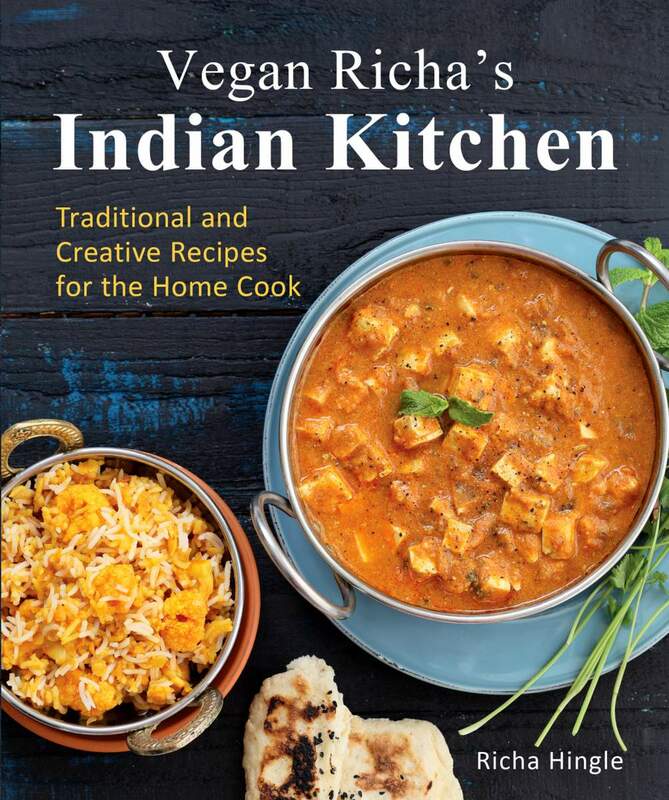 Thankfully, the publisher allowed me to giveaway a Vegan Richa’s Indian Kitchen cookbook to a reader living in the United States. My international readers are eligible to win a copy of the Bonus Recipe Bundle pdf (15 more recipes!). 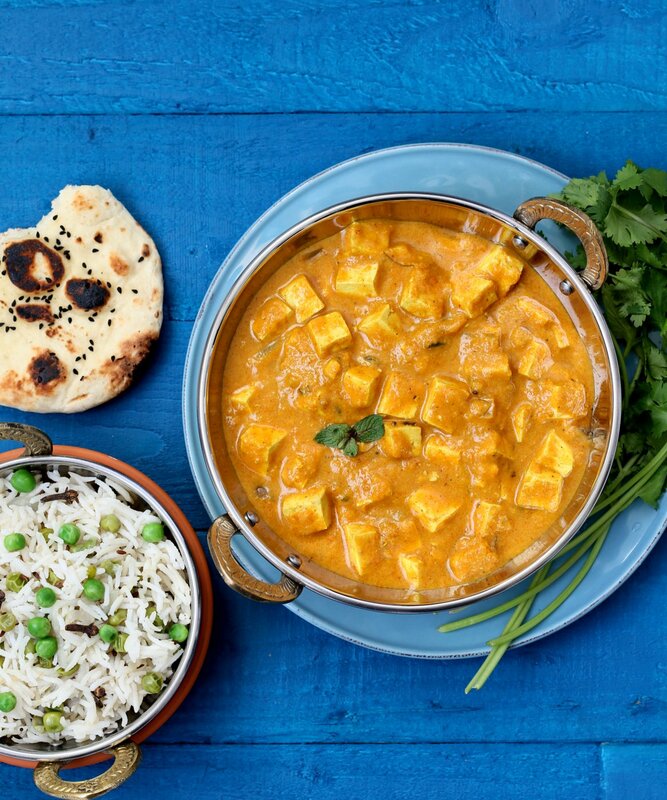 To be entered in the random draw for the book or ebook, please leave a comment below telling me which Indian dish you like the most (and please let me know if you are not from the US). The winners will be selected at random on June 5, 2015. Good luck! PS. There is still time to enter giveaways for Plant-Powered Families and Crave. Eat. Heal. PPS. I am sharing this with Bookmarked Recipes. In addition to not (almost) blogging, you know what else I have not been doing? Exercise. Going to the gym. It has been over 2 months since I have stepped into my gym. For years, I was a morning gym-goer, opting to wake up early and work out before heading to work. After I moved back from Texas, I switched it up to go after work. I knew it was a recipe for disaster, but it worked out well during the winter. In due time, I think I will meander back to the gym but enjoying this relaxed phase to the max. 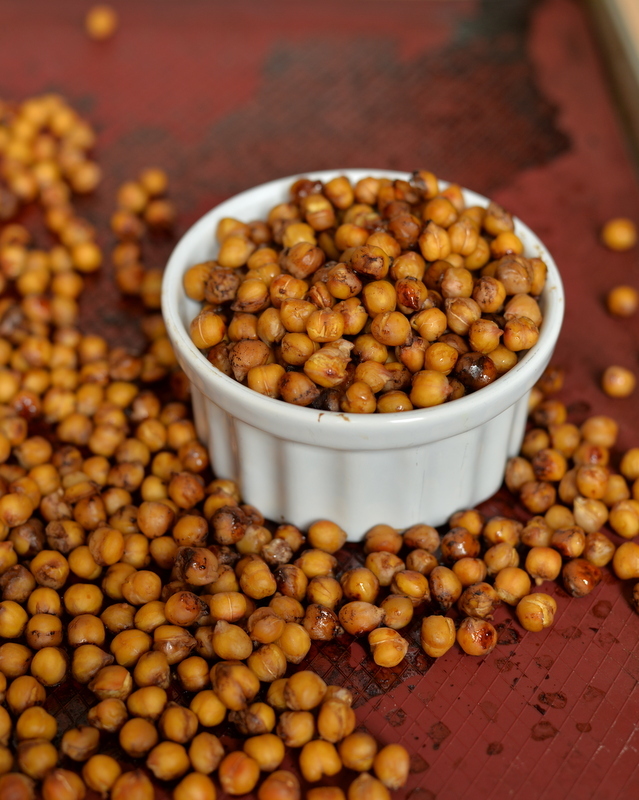 I have slowly ramped up my digestive system back up to its mostly normal high-fiber self, and spent this weekend making (and eating) all the chickpeas. 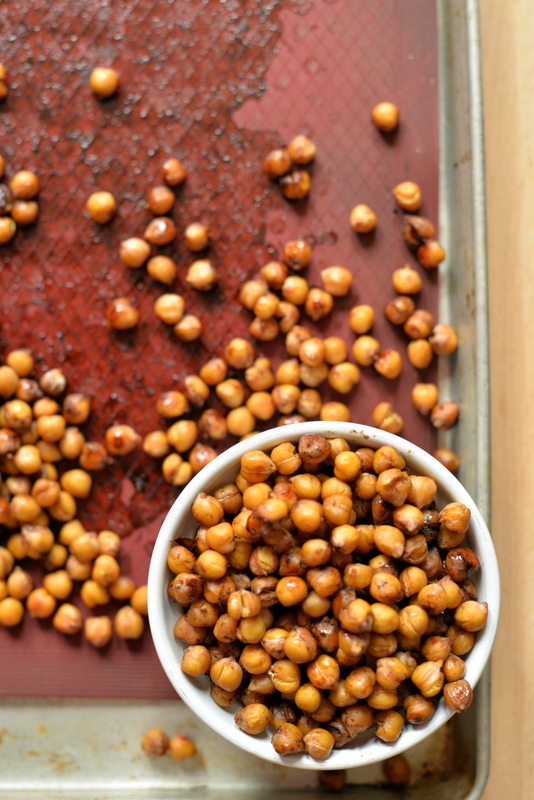 One of the easiest ways to eat chickpeas (after hummus, of course), is to roast them. 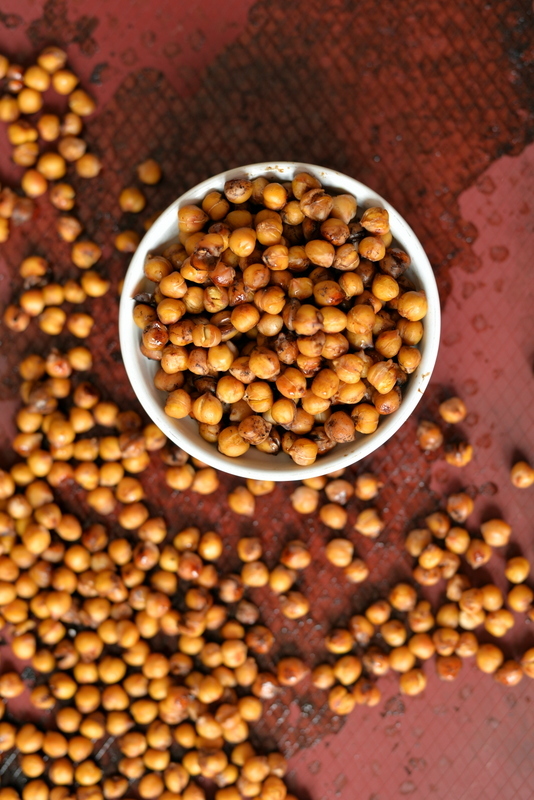 I really liked these salt and vinegar roasted chickpeas, and this batch was a tangy balsamic version with a touch of maple. They roasted up, shrinking in size, but gained a savoury outer crust. Snack on them as they are, or add them to your next salad. The recipe is from Dreena Burton’s latest cookbook. No stranger to her lovely recipes (Black Bean and Sweet Potato Stew, Lemon Mediterranean Lentil Salad, Moroccan Vegetable Phyllo Rolls, and Orange Red Lentil Soup with Coriander and Star Anise), her latest cookbook is focused on family-friendly recipes, catering to the (oftentimes) picky requests of children. 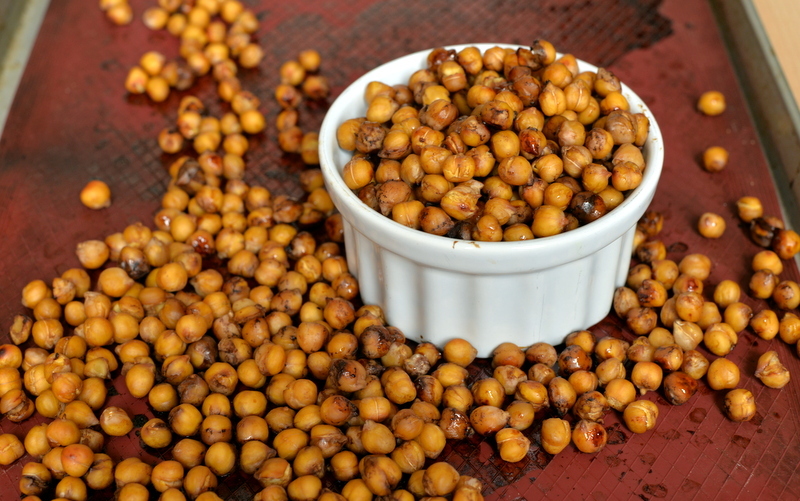 She said these chickpeas were often requested by her children, and I could see why. This is undoubtedly her prettiest cookbook yet with all photographs by Nicole Axworthy (you can see her favourite recipes form the cookbook here and her photo of the chickpea nibbles at the bottom of the post). Indeed, the recipes span the entire day with breakfast recipes like Almond Zen Granola, Savory Chickpea Omelets and Pumpkin Snackles. 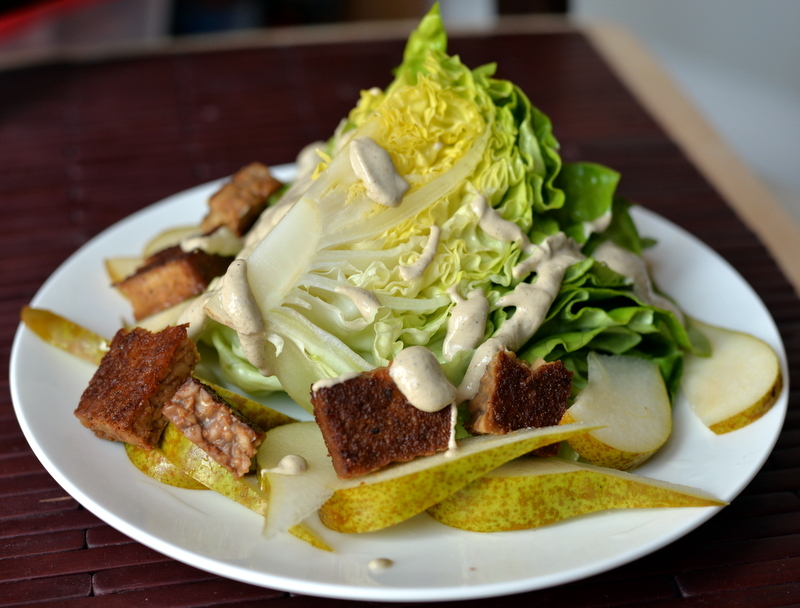 Lunch options include salads with tofu feta, “magical” applesauce vinaigrette, mild cheesy dip and the simplest marinated baked tofu I still want to make myself. Dinner themed recipes include soups/stews like Pumpkin Lentil Soup and Apple Lentil Dal, pizzas/pasta including Polenta Pizza Crust and Hummus Tortilla Pizzas, and Burgers/etc such as Sneaky Chickpea Burgers. Like her previous books, dessert is not forgotten with puddings, creams, sauces, cookies, bars, energy bites, frozen treats, cakes and fruit-based desserts all represented. All of her recipes use plant-based whole foods as ingredients. She has tried to make them more nut-free, a common problem when feeding children going to school. As someone who owns a few of Dreena’s cookbooks, I feel like it is only fair to mention that this is an oil-free cookbook (not necessarily low-fat) and you may recognize some recipes from her previous cookbooks. Some are the same (ie, the umami burgers and blondies from Plant-Powered 15) and other recipes seem similar but have been modified to accommodate nut-free options (ie, her Nicer Krispie Squares) or oil-free options (ie, her Sniffle Lentil Soup). There are definitely new recipes, too, which are true to her signature kid-friendly style. Thankfully, the publisher allowed me to giveaway the cookbook to a reader living in the United States or Canada. To be entered in the random draw for the book, please leave a comment below telling me which vegan food your family loves to eat the most. The winners will be selected at random on June 5, 2015. Good luck! PS. 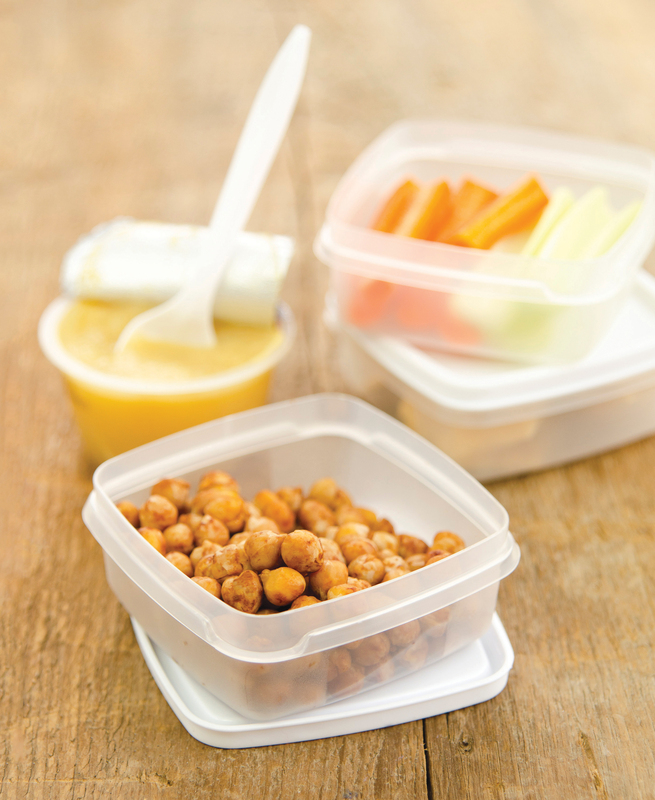 I am sharing this with No Waste Food Challenge and Bookmarked Recipes. PPS. There is still time to enter this giveaway for Crave Eat Heal here. It was a glorious long weekend and it was nice that my body was as eager to move around too. Rob and I spent a lot of time visiting family and friends, and the majority were stopping by our friends unannounced simply because we were in the neighbourhood. The stars were aligned because someone was always home for our impromptu visits. Score! I finally have my cooking mojo back although my blogging mojo is still lagging behind. With the nice weather, I am drawn more to walking in my ‘hood instead of sitting in front of my computer. One thing that has helped to get me cooking again is the multitude of fabulous vegan cookbooks hitting the shelves. One of them is Annie Oliverio’s new cookbook, Crave, Eat, Heal. You have probably met Annie through her blog at An Unrefined Vegan where we she shares plant-based recipes without refined ingredients. Her cookbook has the same philosophy and aims to show that there should be no deprivation. All of your cravings are answered. Annie’s cookbook is broken down into 13 chapters, each focusing on a different craving: carbs, chocolate, comfort, cool, creamy, crunchy, green, junk, salty, spicy, sweet, tart and warm. I am used to the traditional setup of cookbooks organized by course or season, but this was unique. Oftentimes, I do have cravings for something with chocolate, or something crunchy, and this would be a different way to find something satisfying to eat. With this warm weather, of course, I ventured into the “cool” cravings. There were coolers, smoothies and popsicles. Even a sweet potato pie and apple pie spice ice cream that looked phenomenal (and totally happening next weekend). But I decided I needed something a little more substantial and dove into the butter wedge salad. After my surgery, I was on a liquid diet for nearly a week and when I finally improved, all I wanted was to bite into something. Here I was biting and actually cutting into my meal. It has been a long time since I actually used a knife and a fork for a meal, and of all things, it was to cut my wedge of lettuce. Perhaps Annie missed out on potential “cut into your meal” cravings, because I could understand missing this not-so-fun meal normalcy. 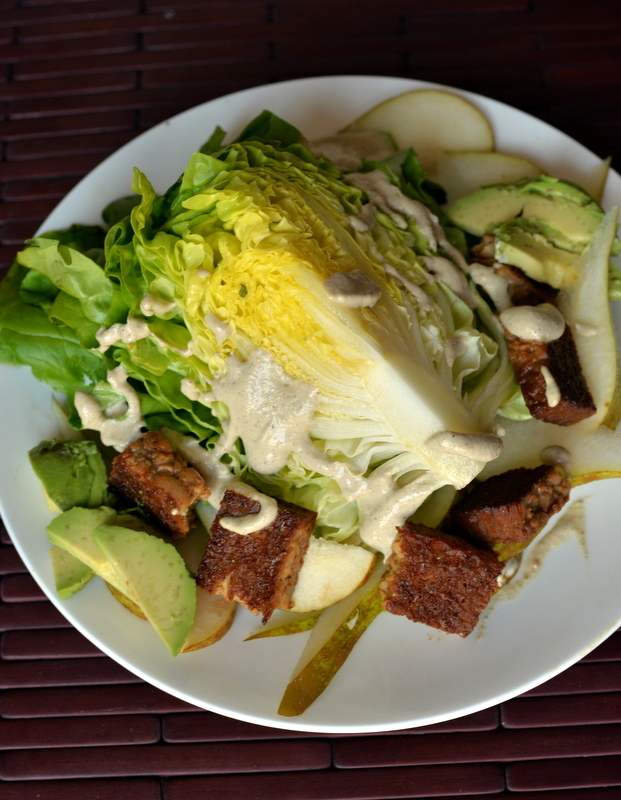 In any case, the knife and fork allowed me to experience every part of the salad with each bite: crisp lettuce, subtly sweet/soft pear, salty/meaty tempeh bacon, creamy avocado and a creamy/cool sunflower peppercorn dressing. 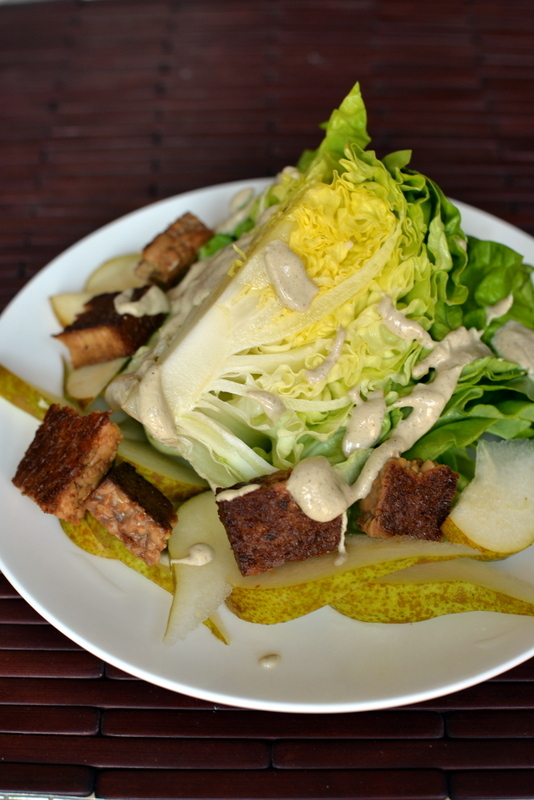 I used a peppercorn dressing base which made for a very intense dressing but it was well balanced with the remainder of the salad. The recipes in Crave, Eat, Heal span sweet and savoury and most are accompanied by Annie’s photographs. Her recipes are nearly all oil-free (not necessarily low-fat), mostly gluten-free, and without processed foods like white sugar. Her photo of the salad can be seen below. Thankfully, the publisher allowed me to giveaway the Crave, Eat, Heal cookbook to a reader living in the United States. My international readers are eligible to win a copy of the ebook Crave. Eat. Heal. Outtakes. To be entered in the random draw for the book or ebook, please leave a comment below telling me what you crave most often (and please let me know if you are not from the US). The winners will be selected at random on May 30, 2015. Good luck! PS. There is still time to enter the giveaway for Superfood Juices here. PPS. I am sharing this with Meat Free Mondays, Souper Sundays, No Croutons Required, Vegetable Palette and My Legume Love Affair. I may have returned back to work full-time but slowly rekindling my interest in eating and blogging. 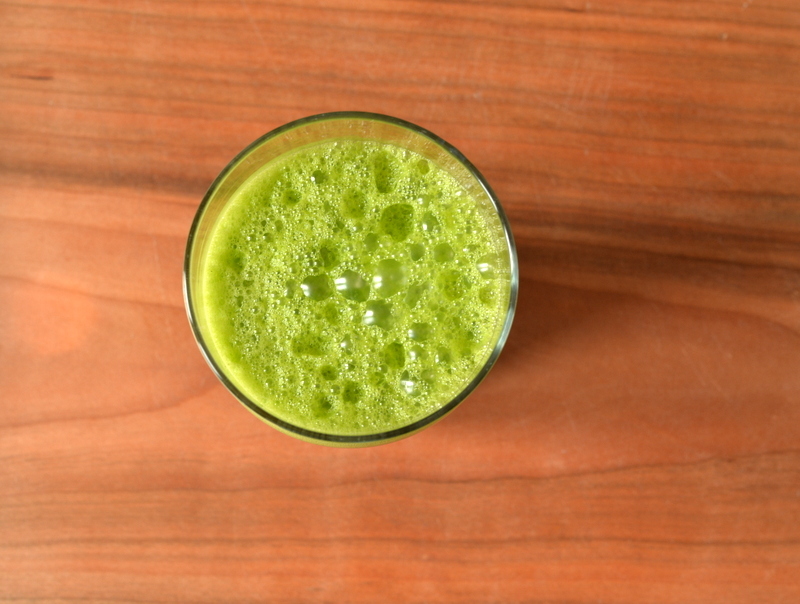 Post-op, I found I had very little appetite but once I had enough energy, I was pretty excited about what I wanted to experiment with: juicing. With a tender digestive system (I always found this an all-too-common description amongst HLBs, albeit completely relevant in my case after a surgery), I knew I needed lots of nutrition without fibre overload. Green juice to the rescue. I inherited my grandmother’s old juicer and must admit that I have only made homemade juice a handful of times. These past few weeks the old juicer was a real trooper. I also learned it was incredibly hard for me to juice kale and greens, although perhaps the hardest part was juicing the stem because once I stopped that, it went much smoother. I also found it easier to juice a lot at once so that I only had to clean the juicer once. With a quick shake, the juice lasts a few days in the fridge. I played around with a few juices from Superfood Juices and my favourite was this green juice with kale, cucumber, celery and green apple. 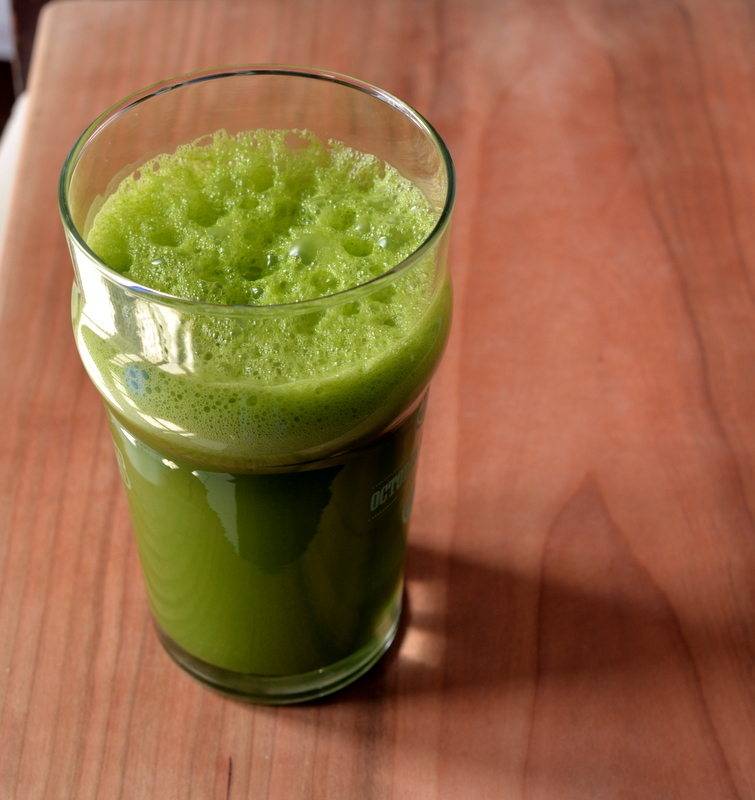 Yes, I even included the celery since it was not too much and it added a savoury hit to the juice. Beautifully balanced, light and not too sweet. It was lovely. The juices in Superfood Juices are unique, yet approachable. Fruits and vegetables themselves are superfoods and this book aimed to include extra “superfoods” as well, such as coconut water, maca, cacao powder, acai berry powder, and also (more unusual) sea buckthorn berry juice, mangosteen juice, aronia berry juice and noni juice. This specific green juice also called for spirulina which I omitted without problems. There are suggestions for substitutions (like swapping unsweetened cranberry juice for aronia berry juice) but they are usually highlights to a recipe and could easily be omitted. The recipes are enticing: honeydew mint chia fresca, mandarin ginger kombucha spritzer, kale martini, warm spiced fresh cider, carrot maca juice, but also seemingly impossible combinations like carrot ginger ice cream or chocolate-mint noni soft serve. A few more down-to-earth options are present too: strawberry rhubarb juice, cantaloupe ginger juice and celery greens juice. Thankfully, the publisher allowed me to giveaway the cookbook to a reader living in the continental United States. To be entered in the random draw for the book, please leave a comment below telling me about your favourite juice flavour combination. The winner will be selected at random on May 20, 2015. Good luck! 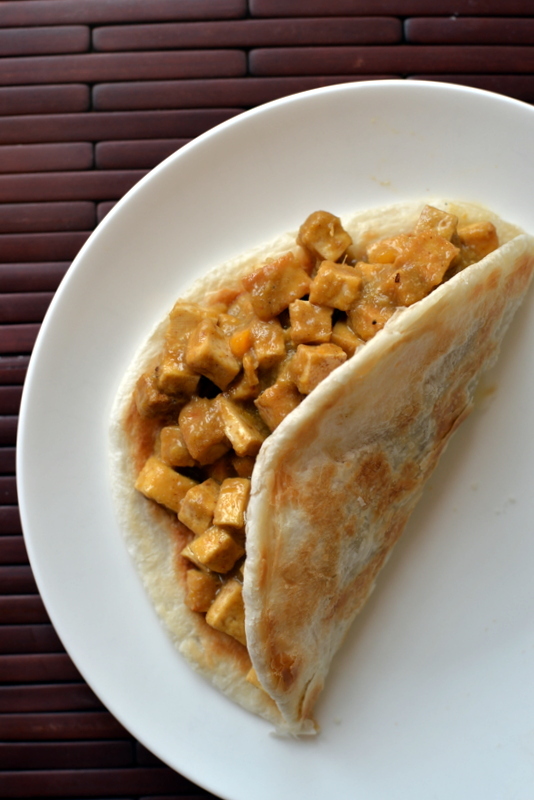 I am sharing this with Bookmarked Recipes and Simple and In Season. Long time no chat. I feel like I have been revived back to life. Those past few weeks seemingly lost into the neverlands. Of course it was all in the name of recovery, but I am at a loss for words as to how I spent my days. I certainly wasn’t at work. There was barely any blogging. I aimed for a short walk a day, usually to the nearby grocery store although sometimes just around the block. And eventually I started feeding myself. At risk of sharing TMI, bear with me. While most suggestions after bowel surgery is to eat a high fibre diet, I found I needed to scale back my typical fibre rich meals. This was one meal that was very easy to make and worked well. 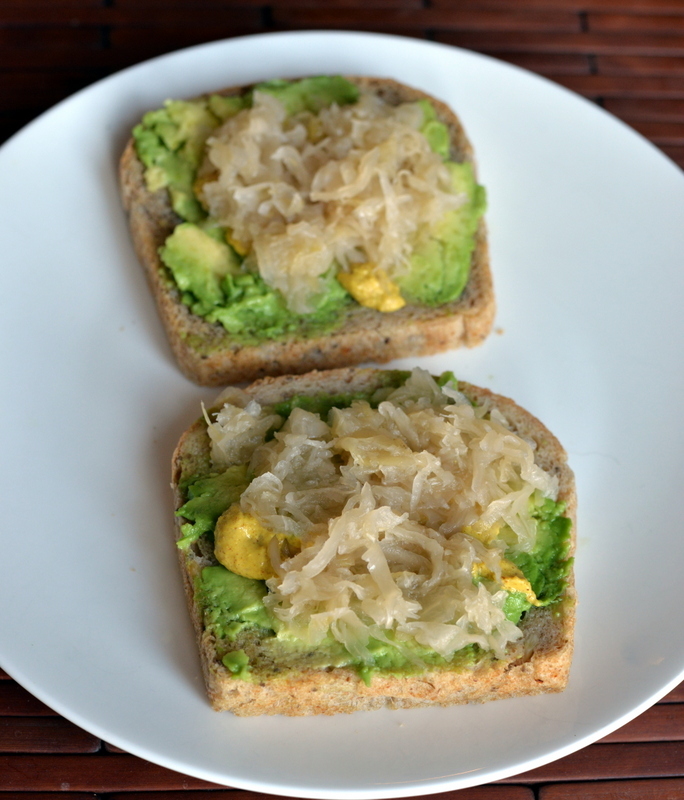 I figured the sauerkraut would be good for adding probiotics after a long stretch of antibiotics but I also really liked this with some smoked tofu. I told Rob the smoked tofu reminded me of cheese although he denied it vehemently. He agreed it looked like cheese but it did not taste like it. 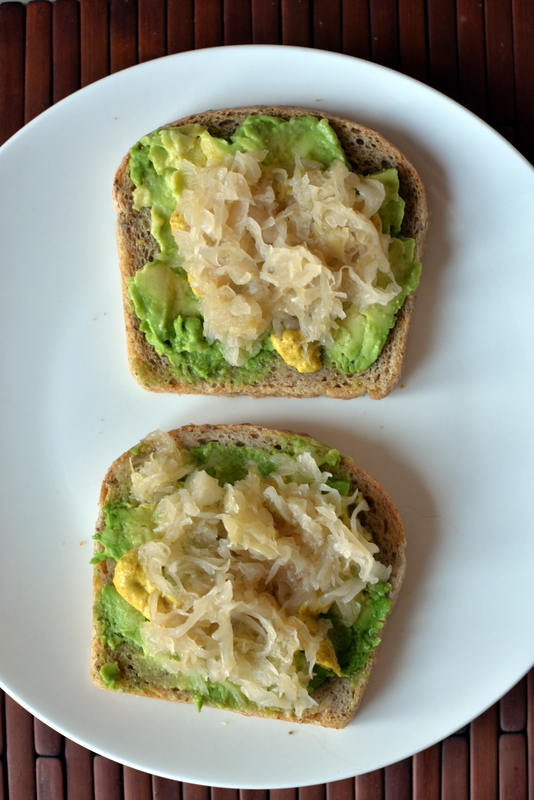 Avocado toast is definitely the sandwich du jour, but it wasn’t until we travelled through Guatemala and Honduras that I truly appreciated its versatility. 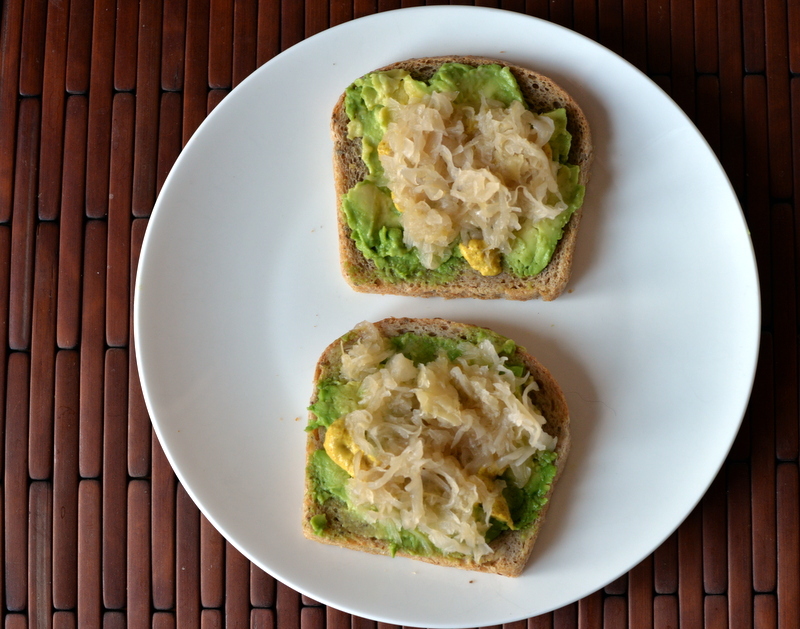 There was a stretch where I had avocado toast (with refried beans and fried plantains) for both breakfast and dinner. It was just too good. Here is Rob’s play with refried for one of our snacks. Enjoy! Have you ever had a rough recovery from surgery? I am sharing this with Souper Sundays, Meat Free Mondays, Eat Your Greens, Credit Crunch Munch and ExtraVeg.